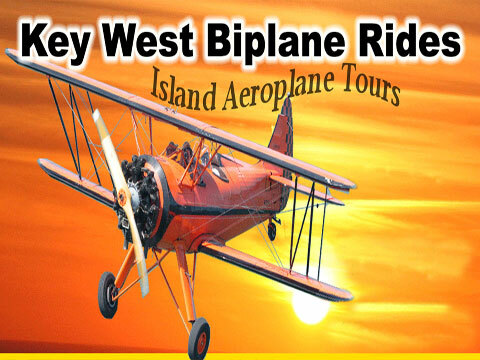 Welcome to Island Aeroplane Tours. We're proud to be the "Highlight" of your trip to Key West. We offer 6 different open cockpit biplane tours for 2 passengers. Our tours are booked 7 days a week, 10 AM- 5PM. Sunset tours are offered and booked by appointment only. We provide you and your partner with a narrated tour of your choice guided by our experienced pilot. Your cruising altitude is 500 ft at about 90 miles an hour. Your flight is smooth and is a similar experience as being in a classic convertible car. All tours are fantastic photo opportunities. We provide the hats, goggles and ear protection. All you need to bring is your camera. Its no wonder why our culture is in love with flying. The wind in your face, when the rumble of our 220 HP continental radial engine roars through the sky it brings a historical perspective of aviation. You'll be amazed by how absolutely beautiful Key West is from up here. Each tour is different. Prices are for 2 passengers & you can pick the time that fits your vacation schedule! All of our tours are recommended for ages 3 years - 100. Handicap Accessible*. 8 Minute Island 18 Minute Shipwreck 30 Minute Coral Reef 45 Minute Boca Grande 1 Hour Sunset (By Appointment Only) We're located at the Key West International Airport in the private section, just past the control tower. You can follow the road straight back to the first hangar on the left, there's plenty of FREE PARKING & our building says "BIPLANE RIDES" Island Aeroplane Tours. Just 10 minutes from downtown Key West. Our aircraft is a original 1941 WACO UPF-7. The Waco is used for our flight tours. The other aircraft we use for Aerial Photography & Aerial Advertising commonly known as sky signs or billboard banners is a 1974 Citabria. We can advertise your business at local festivals, during peak season, or at sunset on a one time pull basis or a monthly contract. The owner and operator of Island Aeroplane Tours (Featured in AOPA Magazine) Is Joshua A Pavia. He was bitten by the aviation bug and became a pilot at the age of 16. He worked at the local airport in exchange for lessons. After graduating high school Josh joined the military as a proud Marine. He received his military jet mechanic license & his civilian mechanics license. After his long 5 years with the military Josh used his GI bill to get an education in Aviation Management and his Commercial Pilots License. He then joined North America's Top Gun as a instructor and A&P. North America's Top Gun is a company that travels the United States. They offer the lifetime experience for every day folks to actually fly a WWII flight trainer. Commonly known as T6's. Word spread all the way down to Key West about his abilities as a WWII airplane mechanic, passion for aviation, and his reputation as an instructor. Josh is the proud daddy of his 6 month old little girl Trinity & his wife Marci works with Josh in the office. This is truely a family owned and operated business. Trinity will be scooting around the office in no time entertaining our guests with her toothless smile as usual.